Since one of the key frustrations for a Canadian financial planner is the excessive time it takes to create a new set of retirement projections, we knew the software had to be fast (you can read about all other reasons why we developed Snap Projections here). But, what does it mean for the software to be fast? We had to break down the experience of a financial planner using the software and consider this question from many angles. We looked at the speed of data entry, the speed of calculations, the quickness of the user interface and how the overall software design can make a planner more efficient. A well-designed user interface can dramatically speed up the data entry process. We knew the user interface had to be intuitive, easy to understand and simple to follow. It also needed a minimal number of required data fields to enter before you can create client’s projections. That’s why we don’t ask you to enter a lot of client data in Snap Projections. For example, you don’t need to enter a client’s address or SIN as they are not material to creating projections. You only need their income, assets, debt and a few parameters around their retirement, for example their retirement age and the after tax spending they need in retirement, to run your first scenario. How quickly the software runs its calculations is critical for the planner as well. We’ve made great strides in this area. Any individual runs (i.e. Run Scenario) used to take a few seconds. Now, they run in just under 1 second and may take another one to display the results (depending on the speed of your internet connection). By far the largest gains were made on Sustainable Scenario that allows you to calculate the maximum level of after tax spending for the client, without the risk of them running out of money. The sustainable scenario runs, crunching hundreds of thousands of numbers, previously took up over a minute and now run in seconds. And, since the calculations are running in the cloud, they don’t depend on your computer. They run equally quickly on a fast desktop or an older laptop. You don’t need to constantly reinvest in your hardware to maintain the optimal speed of calculations. Rather, you can focus on what matters the most – helping your clients make better financial decisions. This aspect was a bit tougher to address as many Web-based applications seem, and sometimes are, slower than their counterparts written for a particular operating system. We circumvented this problem by focusing our full attention on the area of the application where the planner spends the most of her time – the main scenario screen (see below). All updates on this screen are done instantly without the need to reload the page. This way the user experience is exceptional as the update speed is incredibly fast so the user doesn’t have to wait at all for the software to respond. We tried to design the software in a way that lets you create projections fast so you can see the results quickly. But if you want to get deeper and change some variables under the hood, you can. This way you can instantly become productive. 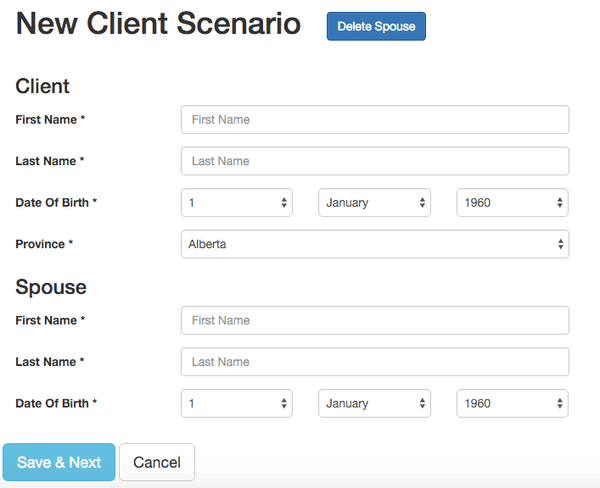 Straightforward projections take little time while you still have an option to override the default settings and make more client-specific decisions – if you need to. From all of the optimizations above, this one is perhaps the most profound. Why? Because it fundamentally makes you a more efficient and a more productive planner. If you haven’t seen Snap Projections in action, you can watch a 5-min Video of Snap Projections to see how it can make you a more efficient and a more productive planner. Here’s the link.